Fill in the blank… Joy to the world, ___ ____ ___ ____! Oh holy night, the stars are brightly shining. It is the night __ ___ ____ _______ _____! One more… Hark the herald angels sing, _____ __ ___ _______ ____! You knew every word and probably sang along… didn’t you? I know I did! What do all three of these songs (and plenty other classic Christmas songs) have in common? They all spoke of Jesus? Yes. They are all beloved, nostalgic songs we’ve known forever? Yes. We have never paid attention to what the songs are actually saying and don’t know what they really mean? Ooh… yep! That’s the right answer. Admit it. If I asked you right now, without looking up lyrics or researching songs, could you tell me an overview or summary of what any one of those songs are talking about? Don’t tell me “Jesus”. We all know that! But really… What are they about? If you’re like most (and like me), you’d have to honestly answer with an “I don’t really know”. It was as an adult that I made the decision to be a Christ follower. That particular year, on an early December afternoon while doing a bit of Christmas decorating at church, someone turned on some Christmas music to really set the festive mood. Nothing could have prepared me for what I was about to experience. The songs began to play… And in typical fashion, I started to sing. I couldn’t have been halfway through the first line of the first song played when it hit me like a ton of bricks. Those lyrics meant something profound. They weren’t just pretty holiday tunes. They were songs of gratefulness and worship to the King of kings. These songs were born out of the souls of those who recognized and understood the immense gravity of what the birth of Jesus launched into action meant. Joy to the world, the Lord has come! Let Earth receive her King! Oh holy night, the stars are brightly shining. It is the night of our dear Saviors birth! Hark the herald angels sing, glory to the newborn king! It was as if I was hearing every one of those songs for the very first time. As each song played, I sobbed in total awe and gratefulness. What a thing Jesus did! I don’t recall if I managed to get very much decorating done that day or not. But one thing I will never forget… Jesus Himself gave me my first Christmas gift as a new believer… He gave me a new song for Christmas. And that new song filled my heart so full of gratitude and love that every song… no matter how many times I’d sung it before… became a new song. The bonus and beauty there is that the songs have never ever become “old” to me again. It really was the gift that keeps giving. If you’ve never read the lyrics to those classic songs before, I recommend it. Don’t sing them… Just read. Let them speak to your heart from the place they were created. Ask God to open them up to you in a light you may have never thought to see them in. You’ll be blessed. I know I am. This post is not intended in any way to be a criticism or condemnation to anyone who disagrees with the content. Many have asked why I choose not to celebrate Halloween. This post is the answer to that question. The last night of the year in the old Celtic calendar, where it was Old Year’s Night, a night for witches… a night for death. October… simultaneously my most and least favorite month on the calendar. I look forward to the change of season. The beautiful colors in God’s creation are nothing short of breathtaking this time of year. I’m also a big fan of pumpkin spice anything! October ushers in a host of goodness. As a Christian mom, October also means gearing up for my annual fight against Halloween. My kids are old enough now to understand why we don’t celebrate Halloween. But it wasn’t always that way. It’s quite a task to reason with a child who sees the fun of dress up and free candy. But somehow we managed. Despite our neighbors, schools, family, and even some churches celebrating, we managed. The earliest Halloween celebrations were held by the Druids in honor of Samhain, lord of the dead. This is the day that the pagans believed to be the most magical and spiritual day of the year. To scare off the evil spirits that Samhain was assembling, the Celts would wear masks. It was a day of dedication and sacrifice, (animal and human), to their god of death. Today, Halloween is considered to be the highest day of worship and sacrifice in the satanic church. Are you thinking “happy” Halloween yet? The argument could be made that normal, regular people don’t celebrate like that. I said the same thing for years until I took a deeper look into the “harmless” ways we, as normal functioning members of society, celebrate this holiday. Look around. As Halloween gets closer, you’ll see homes, department stores, public schools, many local businesses, and practically every channel on TV dressing up for Halloween. Everywhere you look you’ll find witches, ghosts, goblins, demonic figures, cartoon images of Satan, jack o lanterns, ghouls, etc., all in the name of good holiday fun. 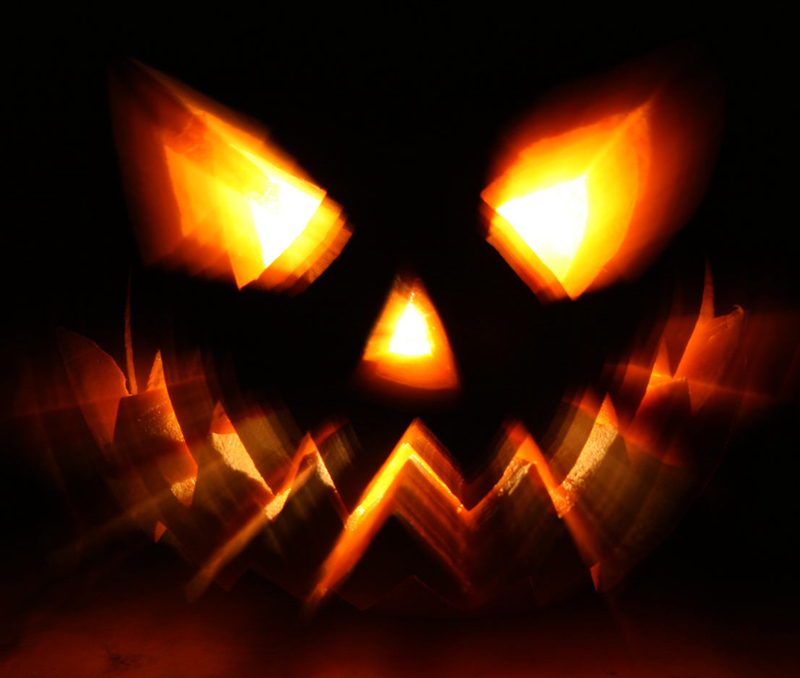 We have called what is evil “good.” We know that there is nothing “happy” about Halloween. Yet, commercially speaking, Halloween is second only to Christmas. According to sales statistics alone, we’ve clearly made the darkness our light. God doesn’t tell us to avoid every kind of evil except the kind that seems fun or harmless to us. Evil is evil, no matter what commercial package it comes in. I once heard a friend say that you can slap some lipstick on a pig, but that doesn’t change what it is. There is nothing good and righteous about witches, demons, ghosts, etc. Hold those symbols in God’s light. What do you see? This view of our world through “God-goggles” is the standard that we, as Christians, are called to adhere to. I praise God for pumpkin pie, falling leaves, hay rides, chilly air, and anything else He has given us with the glorious autumn season. However, I believe God’s made one thing perfectly clear to me…Halloween was never part of that gift. Have you ever embarked on a journey you know was divinely ordered? Have you ever gotten to the middle of that something only to wonder, “what now”? Welcome to my world. A few years back, I started to hear God speaking to my heart that my time at the church that my family and I attended was coming to a close. I even knew which new church He was leading me into. Being the quick learner and immediate responder that I am, it was about two more years until my family and I officially followed that call. Leaving the only church we had ever really known was a huge move for us. Emotionally, it was harder to do than we ever anticipated. Many toes felt unnecessarily stepped on as we made our departure. Sadly, our move was not met with the joyous yet tearful goodbye we had hoped for. There was no celebratory send off or even warm embraces and well wishes. Our move was met mostly with contempt, disbelief and frankly… some really un-Godly behavior. Surely, with a move that difficult, God must have had something colossal in mind for us. In that previous church, I had been quite heavily involved with multiple ministries for more than a decade. I knew in my spirit that I wasn’t to immediately jump into anything at our new church. I assumed it was to keep myself available for whatever major ministry thing God had planned for me. But as each week passed in our new church home, (and nothing mind blowing was happening), I grew more and more discouraged. Had we really heard God? Were we really on the path He set out for us? If we were, I wasn’t seeing why. A friend asked how we were feeling about our church move. I shared that I kind of felt what I can only imagine an empty nester feels. I had spent so much time and energy taking care of the kids (God’s kids… aka the church) that I forgot what it was to have a relationship with my husband (God). Now I was in a place of nothing to do… no ministry… just me and Him… And I couldn’t think of a more awkward and lonely place to be. I remember what it was like when I first met Him (Jesus). I think back on what it was like to be in love with Him as a new believer. There wasn’t a single thing I felt like He couldn’t handle or be trusted with. It wasn’t one sided either… I just knew how in love with me He was. He would do the most amazing things for me… miraculous things! I could physically feel His very presence completely enveloping me. Young love… it’s truly beautiful. I don’t know when the switch happened… But at some point I stopped being His “bride”. At some point I became “the wife”. We’re married. There’s no doubt about that. I said yes. He said yes. It’s a done deal. Jesus promised in His Word that nothing can separate us. I believe Him. Somewhere in that marriage, I think I stopped paying attention to Him. I started paying more attention to the “things” of marriage… work, kids, responsibilities, etc… If you asked me if I loved Jesus, I would have said absolutely yes. But I’d be lying if I said I was still “in love”. I prayed about what to do in our new church. Give me something… anything to do! But I heard nothing. There were no prompts or direction from God to join any existing ministries or start any new ones. Just an awkward silence. Face to face. Me and Jesus. And then it clicked. I was in the right church. I had heard God. We really were on His right path. He missed me. Jesus missed me. The creator of all that is missed me. So in His divine wisdom, He called me out of my distractions and into a place of having nothing but Him… Because He missed me. I’ll be really honest. It was incredibly awkward for me at first. I didn’t know how to talk to Him. I didn’t know how to spend time with Him. You want to know the beautiful thing in all of that? I got the opportunity to fall in love all over again. Don’t get me wrong… It wasn’t as easy as the first time. I’m well aware that the fault in that is all mine. I also know that I’ve only scratched the surface of rekindling my love for Jesus. I fail often in my efforts. But knowing… just knowing that He was willing to spend years of setting me on this journey back to Him. He loves me that much. I’d say that’s pretty colossal… wouldn’t you?